Laptop cases: Get wheeled laptop cases with laptop desks for portable desk space anyplace you use your wheeled laptop case. Laptop cases? Try wheeled laptop cases with a portable laptop desk. Provides handy laptop case desk space anyplace you need to office. Laptop Cases? Try a wheeled laptop case. More Info or OrderCase not Included.WE SHIP TO APO/FPO ADDRESSES. 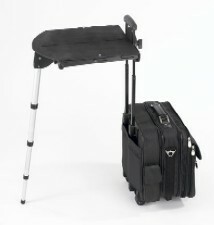 Unique desk � wheeled laptop case combo provides desk space anyplace for your rolling laptop cases. Research Insight - Re-think laptop cases for your mobile work! Just use Desk Space AnyplaceTM...a unique, compact, portable desk...that quickly converts your rolling computer case to off-your-lap work space you can use to "office" anyplace. Still Carry Your Laptop Cases?... Sure! Wheeled Laptop Cases with Desk Space. As you struggle to try and use your lap like a desk-which really doesn't work! Your physical and psychological comfort is less because juggling your laptop and other stuff on and near your lap causes a nagging worry that you might drop your laptop...and many do...! Means fewer shifts in your seated position, causing numbness and even pain, if you don't move or adjust your posture more often...and...a lot less leg-crossing, something you must do--every few minutes--or your legs begin to ache. Finally, less physical movement allows laptop battery heat to build-up against your legs and thighs--where it can become hot enough to cause an uncomfortable, burning sensation. What's the solution?...Desk Space AnyplaceTM on a wheeled computer case can help...!